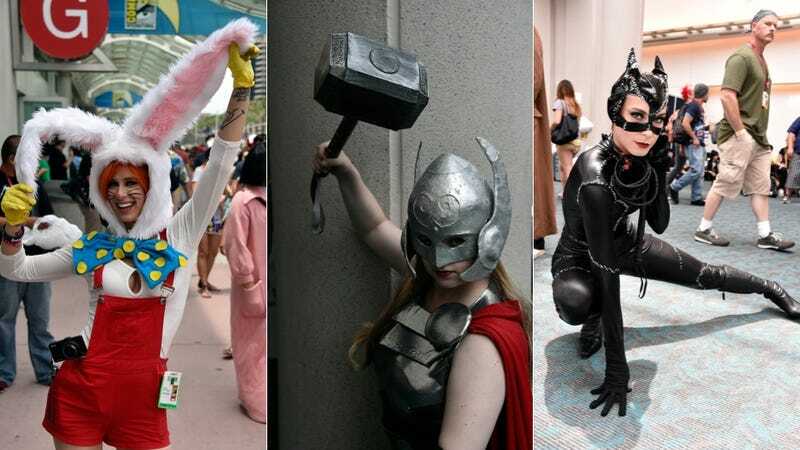 Over the weekend, fandom converged in San Diego for Comic-Con, and while costumed superheroes were lining up to gawk at movie stars, they also had eyes for each other. We were in the elevator after getting off the purple route shuttle for Comic Con around 5 pm. I was dressed in a Captain America dress. You got out on the 12th floor. You were really attractive. Maybe you'd like to talk or something. Lower that (metaphorical?) shield and engage next time. This next Missed Connection has it all: The potential for romance, making a kid's dream come true, and supporting a small business. Hey guys, met this very interesting 6ft7in engineer who builds custom go karts outside of Comic con. And my son will not stop bugging me now! And I thought he was kinda cute, too. Anybody remember seeing him? My kid will not stop talking about him and his go karts. This next gentleman had a meet cute on an escalator, but the ending needs a rewrite. Did You Want To Fight? Are We In Love? I was going down the down escalator and you ran up it. You bumped into me and when I turned around to talk to my friend I noticed you were staring at me. We held eye contact until I got to the bottom of the escalator. The top of your head was bleached and you were wearing a snapback. I was in a green hoodie. Maybe we can hang out at comic con or I can show you around (I'm a local). Tell me what color your coat is so I know it's you. Hopefully you see this. In the next situation, the young man possibly botched his attempt to get the young woman's attention. Hit me up if you see this post and are interested. "You are probably asian but I'm not sure." Best.